A college newsletter can be an exceptional tool for recruiting donors and students—really. But how do you entice a potential donor or student to actually read your newsletter and engage with your school instead of throwing out your valuable insights with the grocery circulars and tire ads? A productive newsletter is not only read, but is part of a dynamite program that brings unknown prospects into a warm relationship with your school, which is key to recruiting donors and students. The objective, then, is to make your newsletter as eagerly snatched from the mailbox as a personal letter from a friend. This objective is possible with the newsletter template outlined below, specifically tailored to Christian colleges. Sample content is also provided at the end of this article. The key principle to cultivating prospects though your college newsletter is the relationship your students build with people who are supporting and praying for their spiritual, personal, and professional growth. This relationship starts at the application process. In the application for admission to your school, require students to recruit three prayer partners from three different addresses. Suggest recruiting family and mentors (who would be potential donors) and friends (who would be potential students). 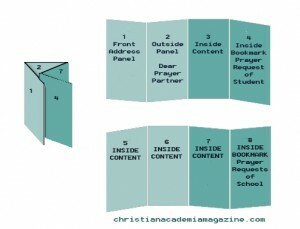 Rather than calling it a newsletter, it can be rightfully presented as a Student Prayer Journal. Using a legal sheet of paper, make two folds: folding it in half and then folding it in half again will result is a sheet that is the size of letters placed in envelopes. Do not use envelopes. The folds create four sections on each side of the paper. This is known by printers as a double parallel fold. Outside Panel 1: Place address labels and stamp. Outside Panel 2: Your students hand-write a note to their prayer partners about something he or she is learning at school. Your newsletter will no longer be identified as junk mail and will very likely open the newsletter to find a personalized gift awaiting them from their student. As the newsletter is opened, the four panels unfold to expose the bottom quarter panel, which you will make into a perforated bookmark. Bookmark Side One: Include prayer requests from the school. Bookmark Side Two: Students handwrite their personal prayer requests. Include instructions to place this panel in their Bibles. Content that shows why the friends of the student or the children of the potential donors need to attend or support a school like yours. (Read our article how to make your school stand out to prospective students by focusing on programs instead of hyper-tuition discounting. After a few months or more of engaging with your students, include them in your ongoing fundraising program. Invite your new prospects to your fundraising events. Ask if they would like to volunteer for a campus project. Send them tasteful fundraising letters, thanking them for their prayers and sharing how their spiritual support is benefiting the student. Below are benefits and sample content for this type of newsletter. The newsletter is not perceived as junk-mail from a strange school. It is a personal note from a friend. Prayer for the student and the school leads to spiritual resources for all involved. For Theology students, keeping them connected to relationships at their home church through the Prayer Journal can help them stay focused on the vision that brought them to your school. That vision is reinforced when they are known back home as a serious student of the Bible whose ministry skills are growing with every communication. Praying for your students and school is a spiritual investment for prayer partners that results in a positive outlook and a spiritual bonding with your school. That investment helps to cultivate friends for the school who may at some time donate or recommend your school to a prospective student. Positive PR for the school will develop as prayer partners converse about the students they are praying for with others. This is handwritten by the student and is the back flap of the mail-out. Thus, the letter is immediately identified as not being junk mail. In this section, the student should write about something he is learning at school. 3. Not at Our School! Provide quotes by professors in secular academia who passionately promote unscriptural values or worldviews. Or describe incidents at secular schools that defy your school’s values. Examples include professors or events that are anti-Christian, anti-capitalism, anti-marriage, anti-men, anti-American, pro-moral relativism, pro-liberal politics, pro-ACLU…. Provide the reasons why the Church needs schools like yours. The student further personalizes this letter by hand writing a few prayer requests. This perforated section is for placing in a prayer partner’s Bible. Note that the other side contains the school’s prayer requests. The president writes an article or letter that helps cultivate future students or donors. It is especially appropriate to share the vision of something you hope to accomplish, a story of a student or alumnus, or a victory you can celebrate. This could be a nugget from one of the courses being taught this semester, thoughts on academic excellence at Christian colleges, why it is better to learn through the lens of a Christian worldview, the life and ministry of a faculty member, or ways faculty build personal mentoring relationships with students. The school cultivates the goodwill of the student’s friends and family by providing a few prayer requests. This perforated panel is for placing in a prayer partner’s Bible. Note that the other side contains a student’s prayer requests to the addressee/prayer partner. No longer does your school’s newsletter need to be as eagerly welcomed as junk mail. A newsletter can be an exceptional tool for recruiting donors and students—really. Dr. David Agron leads an accreditation consulting firm which, since 1999, has specialized in helping Christian colleges achieve accreditation. 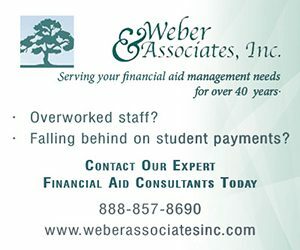 Find information at www.accreditation101.com. 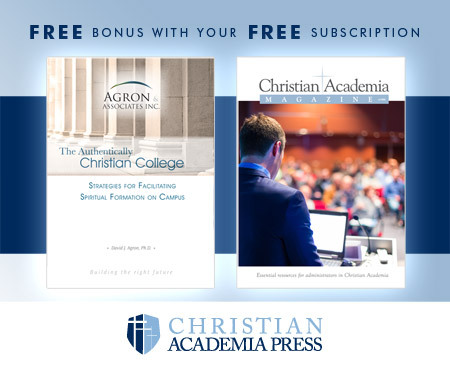 Dr. Agron is the managing editor of Christian Academia Magazine. He also serves as an accreditation consultant. Since 1999, Agron & Associates, Inc. has specialized in helping Christian colleges achieve accreditation. In both roles, his mission is to help raise up Christian colleges in quality, quantity, reputation and impact for the Kingdom of God. If you would like to discuss how his firm can help your school achieve accreditation, contact him at dagron@accreditation101.com.